There’s a new bad kid on the block driving lung disease, including pulmonary hypertension and inflammatory diseases: dysfunctional mitochondria. Mitochondrial dysfunction as a driver of oxidative injury is not new, but technological advances are helping researchers and clinicians understand just how intimately involved mitochondria can be in disease pathophysiology—and to identify new therapies that target mitochondria. 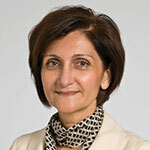 Dr. Erzurum will co-chair the first basic science symposium of ATS this year, Setting the Stage: Mitochondrial Dysfunction as a Driver of Chronic Disease. She will share the podium with Jane C. Deng, MS, MD, associate professor of pulmonary/critical care at the University of Michigan. Mitochondria have been recognized as essential players in human health and disease since they were identified as the primary cellular energy source used by aerobic organisms nearly a century ago. The Krebs Cycle oxidizes nutritional components to release chemical energy in the form of adenosine triphosphate. The same cycle produces precursors of amino acids and other biologically active compounds that play key roles in multiple biochemical pathways. Metabolism has long been known to have effects on gene expression, Dr. Erzurum says. In fact, one of the first well-understood metabolic genetic control mechanisms was the lac operon that allows prokaryotes to metabolize lactose in the absence of the preferred carbon source, glucose. It wasn’t until the 1980s that the wider regulatory functions of the mitochondria began to emerge. Mitochondrial activity doesn’t just regulate energy production, it regulates cellular function and activity in response to environmental factors, such as nutrition and exposures such as tobacco smoke. Lung dysfunction in COPD? Mitochondrial dysfunction from smoking can lead to immune dysregulation that alters lung function. Oxidative stress in the airways can lead to mitochondrial dysfunction and lung disease, which might be alleviated or reversed using mesenchymal stem cells. A growing list of immune-mediated disease physiology is being tracked upstream to mitochondrial dysfunction. Many of those newly recognized pathways suggest novel therapies that target the mitochondria.